You are currently browsing the archives for the Roofing category. We have a flat roof on our garage that’s been leaking. The roofing is at least 15 -20 years old. It was tarred by the previous owners to try to fix the leaks. We even tried tarring it as a temporary fix. That only moved the leak to over parts of the roof. 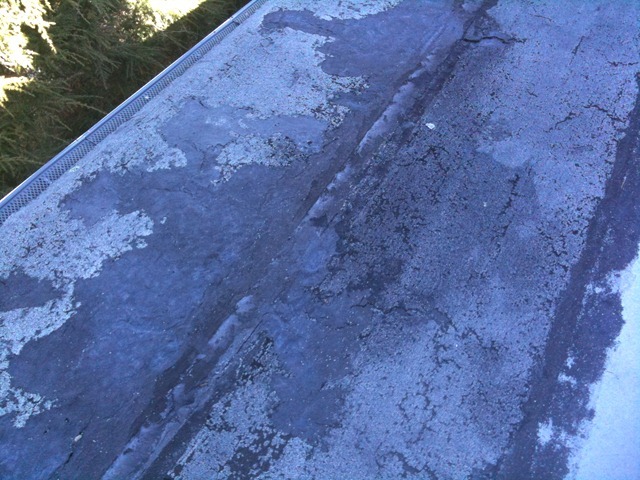 Flat roofs are difficult to keep from having problems. I had a few roofers and contractors in to discuss how to fix the problem. They all agreed that we needed a new roof (you can tell from the photo above). They differed on how to fix the problem. One contractor suggested using GAF Liberty roofing. It’s an asphalt mix made especially for low sloping roofs. In the end I decided our roof was too flat for this option. Another contractor recommended a rubber roofing the comes in 4 feet wide rolls. Some varieties of this needs to be torched to seal the seams. I didn’t want a torch to be used on our roof and was worried about all of those seams leaking in the future. The last contractor recommended using a large rubber sheet to put on the roof. This made the most sense to me in terms of staving off future leaks. Also, that contractor installed the same material on the flat roof on his daughter’s house (she’s our neighbor). That’s a good recommendation for me! This rubber has only a couple of seams with a cement adhesive. There is another area on the house that has a low slope (but not as flat). 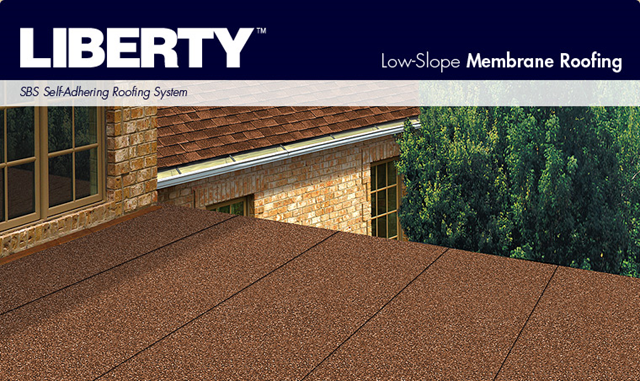 This roof you can see from the ground, so they put the Liberty roofing there and matched the color to the regular roof. You can see in the image above how the Liberty roof in the foreground matches the regular roof in the background. 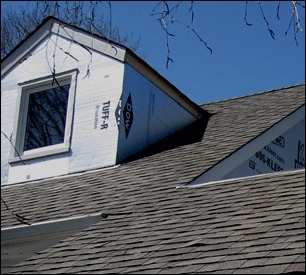 Talk to a few roofers to see what they recommend for your roof. Often you get a better idea which is the best choice for you after you hear all the options. 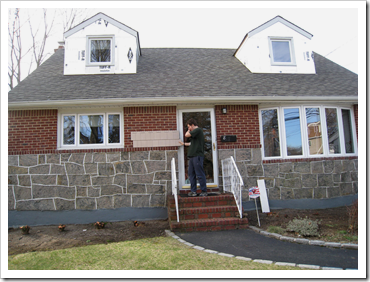 This entry was posted on Monday, March 29th, 2010 at 12:25 pm	and is filed under Roofing. You can follow any responses to this entry through the RSS 2.0 feed. You can leave a response, or trackback from your own site. 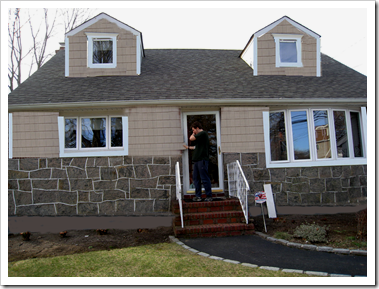 I used the clone stamp in Photoshop to paint the siding on the house where I wanted to side it. Eventually, once I added large swathes of siding on the house, I copied and pasted bigger pieces. I added the cornices above the upper windows from another photo I had of another house. I also painted the foundation a different color using the paint tools. 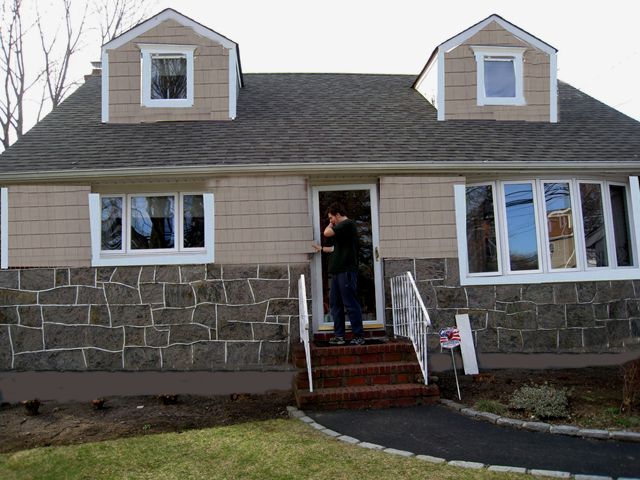 It’s not a perfect representation, but in an hour, I was able to come up with this photo to get a general idea of how the house will look covering the bricks and using this color siding. 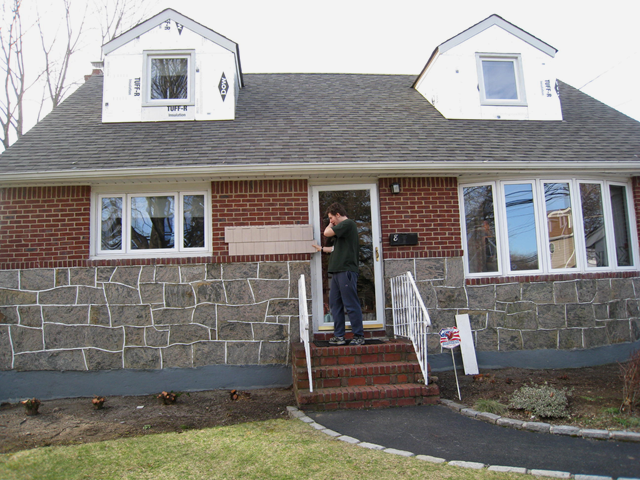 This entry was posted on Saturday, March 27th, 2010 at 12:49 pm	and is filed under Computer Tools for Renovations, Roofing, Siding. You can follow any responses to this entry through the RSS 2.0 feed. You can leave a response, or trackback from your own site. Colors are tricky. If you’re very precise about color – BEWARE! The samples you see in the store and the brochures can be different from what you’re going to get. If this is very important to you, I’d recommend asking for a sheet of roofing to see what the current batches look like. Also, roofs can fade over time. 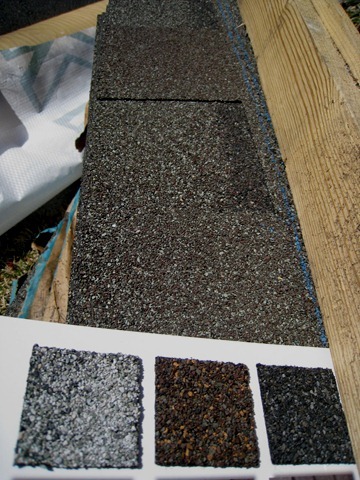 Our roof has less brown in it than the sample. It has more grays and burgundies. Another point to consider when you choose a roof color is how variegated it is and whether you want a more consistent look or if you like contrasting shingles. 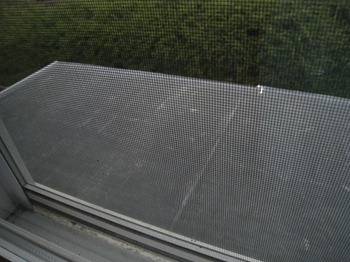 This entry was posted on Saturday, March 27th, 2010 at 12:00 pm	and is filed under Roofing. You can follow any responses to this entry through the RSS 2.0 feed. You can leave a response, or trackback from your own site.